I’ve been considering for some time the inadequacy of the TDAA Judges’ Report. It’s modeled on other, traditional, venues. Because of that it’s not a very good fit for the TDAA. Consider that we do that no other venue does, or probably can do. We can play any game imaginable in dog agility. As a consequence we’re spread all over the place in terms of our understanding of games, how they are played, and how to set qualifying criteria that doesn’t “skunk the field” or “give away the farm”. Frankly, we err to the latter far to often. What we should be doing effective almost immediately, is asking the judge for an analysis of each of the games played on the weekend. Very specifically we need to focus on the qualifying rate. The judge should provide analysis as to what happened that might have been unexpected in terms of course design and how completely the briefing deals with what might happen in the game: Mindful of our understanding that “anything that can happen, will happen”. Our analysis of games needs to go to a central repository of learning so that it can be shared with other judges who’ll be faced with design and judging for the same game. If we take this initiative the Judges Report will be reflected in the Book of Agility Games for future generations of judges. Following is a description of the game Cha-Cha by Jeff Boyer. I’ve added some discussion (under “Scoring”) about setting qualifying criteria for this game. This comes directly from course review with the designing judge. Cha-Cha is the invention of Jeff Boyer. The Cha-Cha dance was invented in Cuba sometime in the late 1940’s and early 1950’s. A Latin dance, it is characterized, generally speaking, by two slow, rocking steps, followed by three quick steps (the “cha-cha-cha”) danced to a 4/4 beat. (And “slow” is a relative term.) In this game, the handler must figuratively dance the Cha-Cha with his dog around the “ballroom” (the agility ring). Refusals will not be faulted. It is the judge’s decision as to whether the Four-Paw Safety rule is in effect. The dog may begin anywhere along the start line. Time begins when the dog first crosses the Start line. The timer will blow the whistle at the end of point accumulation time, at which point the handler must direct the dog across the finish line or to the finish obstacle to stop the clock. In TDAA, small dogs (4/8) will have 60 seconds to accumulate points, and big dogs (12/16) will have 55 seconds. The sample course above I put together to test the random nature of the game. It was based on an existing standard course. Still I found myself adding jumps to the course to create three jump pinwheels and jump sets so that the jumps weren’t isolated (nothing but trouble under the stated rules. One of the biggest mistakes TDAA course designers make with “dogs choice” courses is having too much distance between the obstacles. A dog’s choice course that is too spread out will NQ a lot of dogs. Judges will often argue the point with me. But that’s just because they don’t get it. Almost always games like this require some front end analysis in order to set proper qualifying criteria. It shouldn’t be so hard that nobody qualifies, or so that even the really wobbly and badly executed runs manage to qualify. The qualifying criteria should reflect the requirement for performance Respective to the venue. 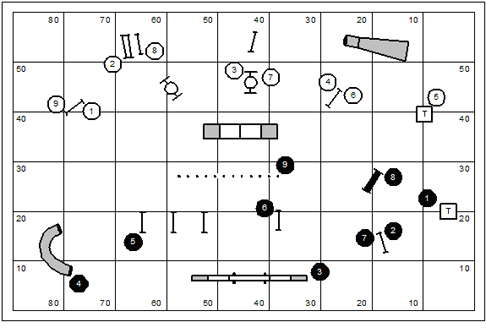 An obvious criterion for performance would have the Masters/Superior dogs performing 20 obstacles in a set time comparable to the time use for a standard class; while Advanced/Intermediate would perform 17 or 18, and Novice/Beginner would perform 14 or 15. This course (actually used in TDAA competition) measures about 108 yards. The judge should run the measured path through a rate of travel calculation. All of the numbers fit neatly in the course times of 50 seconds big dogs, and 55 seconds small dogs. For this design the judge should probably set the qualifying criteria at: G1=30; G2=34; G3=40. Note that the G2 qualifier takes advantage of the 2 pts earned for each obstacle in a partial set. Cha-Cha is a game that requires the dog to earn points to the beat of the Cha-cha: A Latin dance characterized by two slow, rocking steps (non-jump obstacles), followed by three quick steps (jumps only). This is a game of strategy and precision. More often than not I begin design in my own training center with “the game”… whatever we’re playing for the week. Then the sequencing or handler training that we do emerges from the set of the floor like a found poem. The Four Leaf Clover I set up last week has its obvious training bits: handler staying in the box and sending out for the different elements. We can also do a bit of “train the dog” by forward-chaining calling the dog through a set of weave poles or sending the dog through a set of weave poles. Less obvious are the raw handling sequences that can make any set of the floor quite interesting. In this numbered sequence the handler is posed with a couple difficult transitions, probably accomplished with a Front Cross. We find with the faster dogs and the long-striding dogs that it is an opportunity to practice a pre-cued Front Cross. The first Cross, in the transition from jump #2 to the pipe tunnel at #3 allows me to study the rock on a string theories of release. If the handler flinches, the dog is bound to off-course over the #4 jump. The second Front Cross, from #4 to #5 requires a considerably different handler position and poses a real test of the pre-cue. This whimsical sequence might not be as simple as it looks. In the transition from jump #3 to #4 the pipe tunnel beyond jump #3 surely looms large for a dog with good obstacle focus, particularly if the turn goes a bit wide from #2 to #3. What I’d like to study here is a continued pre-cue through the turning jumps, @2 and #3 and then, of course, a quick release out to jump #4. In the transition from jump #4 to #5 the dog has to be looking at the wrong-course pipe tunnel. 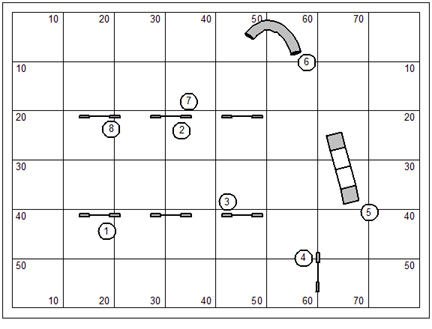 The handler has to work for a corner of approach to jump #5 because it is clearly a blind/managed approach to the jump. 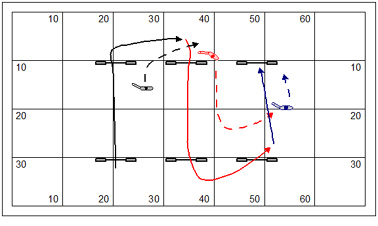 The particular skill we will work on is drawing the dog tightly into handler focus to make the corner and then releasing to obstacle focus through jumps #3 and #6. This particular skill, drawing the dog into handler focus, is probably a simple matter: arm up is obstacle focus, arm down is handler focus. At least that’s the way I teach it. We can have a little more fun here with the blind approach, this time to jump #2. It’s really a complicated bit, if you think about it. In addition to setting the corner of approach to #2 the hander should work for a left-turning transition from #4 to #5. If the dog turns to the right after jump #4 the dog’s path is liable to be quite wobbly. The solution to the transition from jump #6 to the weave poles at #7 really depends on whether the handler has dog-on-left at jump #6, or dog-on-right. Dog-on-left might be the simpler matter. Sometimes just the absurd… this is a snookeresque sequence, requiring the handler to move his dog across the field giving one or more tempting obstacles a pass. How would you do it? In Bleak House by Charles Dickens is the first recorded use of a word that is common today. What is the word? Okay, I want to say something technical. I’ve been wrestling with this for awhile now and I think I’m getting close to calling it observable science. A “Static Post” is a moment when the handler is forward of the dog… and comes to a complete stop. In this illustration the handler has arrived at the #2 jump forward of the dog and comes to a stop. You’ll note that in the transition from jump #2 to #3 the dog has three wrong-course options. These are labeled “a”, “b”, and “c”. The question for the handler is one of timing. Note that the way I teach this the handler does not turn to face the #3 jump. Instead he should remain in his stationary position until the dog turns completely to jump #3. Only then should the handler make any movement to continue. This is analogous to the “rock on a string”. You have a rock tied to a string and you’re spinning it in a circle. When you let go of the string the rock will be released into space on a path perpendicular to the radius of the circle defined by the string. I told you I was going to say something technical. Any movement the handler makes while in the Static Post will release the string, and so release the dog into space. You’ll note the three red lines after jump #2 pointing at each of the three wrong-course options. Each of those represent where the dog is likely to be released if the handler moves, rotates or flinches at or before the moment the dog has made that much of the turn. It takes extraordinary discipline for the handler to remain stationary until the dog completes his turn. But that is exactly what makes the movement successful. Note that the Static Post is a precue. That means the handler should come to a stop alongside the jump before the dog gets to the turning jump. And indeed, the handler should get there enough forward of the dog that the dog has time to respond to the turning cue. First of all, notice that the sequence has changed. Now the handler is doing a bit of a monster threadle with his dog. This time the handling choice is a pre-cue Front Cross with the handler facing back toward the dog but giving pressure to the jump by backing up through it. Again the question of timing will dictate the handler’s success in the movement. The handler should not move, rotate, or flinch until the dog’s head is pressing between his thigh, and the jump. Any movement or flinching might release the dog. And now there are four options for the dog to admire before drawing into position alongside the handler. To tell you the truth the foregoing examples might seem a bit on the fanciful side and beyond the ambition of the average player. So let’s look at a more common example… the Front Cross. In this illustration the dog will have two wrong-course options before the Cross, and another option after the Cross. Again, the handler requires timing discipline for this movement. As the dog comes over the jump the handler will rotate away (counter-rotate away, actually), and then come to a complete stop to await the dog’s participation. I also see the handler dropping his lead against his leg to draw the dog into handler focus. If the dog initially goes wide on the turn the wrong-course dummy will certainly loom large for the dog. The handler must be still, no movement, rotation or flinching, until the dog wraps his body and addresses the correct entry to the tunnel. The Front Cross in this scenario is quite technical from a timing point of view. There are two moments in which the handler must be careful not to release the rock on the string. I am an advocate of games in agility training. Games test the skills of both dog and handler. They promote a playful approach to the sport. I find playing agility for the fun of it is obvious on the one hand, but radical on the other. Below I’ve illustrated Four-Leaf Clover, one of my favorites, a distance training game. I’ll be judging TDAA at ARF in Gahanna Ohio this weekend. If you aren’t signed up for it, I’m pretty sure they have day of show entries! ARF Dog Training Center is located at 1000 Morrison Road, Suite I, Gahanna, Ohio 43230. The Trial Secretary is Suzanne Terrant doctpets@yahoo.com. This is a delightful training game concocted by Canada’s M.J. Thuot. This is a directional game mostly intended for Novice dogs and handlers. It can be played individually or in teams of two or three. This is just the ticket for tunnel enthusiastic dogs. Perfect for a Corgi, eh? The dog runs the numbered sequence beginning with the weave poles (the stem of the clover) and then performs each of the leaves of the clover. Note: Although the clover is numbered the leaves can be performed in the order of the handler’s choosing. The dog earns a 5 point bonus for each element performed without fault while the handler remains in the box. Tunnels are bidirectional. A dog that earns all five bonuses will earn an additional 25-point bonus. Four-Leaf Clover is scored Time, Plus Faults, Less Bonuses. The judge will signal both faults and bonuses. Faults will be added to the dog’s score; bonuses earned subtracted. This was obviously designed for play in the TDAA. You can tell by the short transitional distance between the obstacles and the diminutive size of the equipment. It would be possible, I suppose, for a dog to qualify without doing any of the distance challenges. But that handler wouldn’t be distinguishing himself in this game. Given the five distance challenges and the possibility of an additional 25 bonus points, it’s very likely that some dogs will have a negative over-all score. Though I’ve been playing the game for years I think I noticed just for the first time the little bit in the intro paragraph “It can be played individually or in teams of two or three.” I don’t think I’ve ever played it with teams. I’ll have to cogitate on that one. If you have a field of excellent distance working dogs this is romping design. Remember that the clover doesn’t have to be taken in the numbered order. The order the leaves of the clover are entirely up to the handler. There might be a bit of strategy for picking the order. There are a variety of categories of trainers in the dog agility game. The Club Trainer is one of the most prevalent. Typically these come from the established Dog Training Club (DTC) or Obedience Training Club (OTC). However, it might even be a club that was established specifically to do agility. The Club Trainer is a volunteer position and sometimes even an elected position. The difference between the Club Trainer and the franchise holder is strictly a matter of ownership. And there’s the respect (to quote Hamlet) to make calamity of life so long! To give the Club Trainer his respect, a great number of them are very knowledgeable about training dogs and handlers to be successful in agility. They understand the importance of foundation work; they understand dog training and how to create a conditioned response; they understand the role of relationship between the agility handler/trainer in the development of the team. But, like they say, a dead clock is right twice a day. The real problem with the Club Trainer is that the students they are charged to serve are not their customers. The Club Trainer doesn’t pay the bills. He never looks at bottom line. He holds up measures for success that have very little to do with the viability of agility training as a business. The break-out attribute of the Club Trainer is his ability to treat his students (and customers) with compassion and respect. I’ve been saying that they aught to send Jerry Sandusky to Uganda for the disposition of his troubling legal matters. But nobody seems to get the joke. Speaking of punishment… If the Philadelphia Eagles lose another football game they’ll likely take Michael Vick, hook him up to a bunch of car batteries, and throw him in the pool. I think Michael actually invented the trick for dogs that can’t win. It’s cheaper than euthanasia. I am in Springfield, IL this weekend leading two clinics in a dirt floor barn. I’ve just finished the first two days which was, ostensibly, an introduction to distance handling/training for fairly Novice players. It has already been, on many levels, a most memorable visit. It was a fun bunch of people just to be around. And, being Novice they were pretty much what they were supposed to be. “Novice” means that they are grappling with elementary concepts that more advanced players take for granted. I really love teaching basic skills. The lesson plan was a split between basic distance training and, frankly, handling fundamentals. The problem with “distance” training in general is that it is really all about training the dog. We train the dog to understand the independent performance of obstacles. And we train the dog to confidently work at a distance. This is stuff that takes months and months and will not be accomplished in the context of a two day seminar. Frankly dog training can be tediously slow stuff which will frustrate the player if that’s the entirety of the lesson plan. That’s why I include a generous mix of handling topics because the handler can run, be free, and have a sense of basic accomplishment. Here’s a handling bit I put up between painful distance drills. It’s a little bit on the technical side. There are no fewer than five discrimination riddles in this short 12 obstacle sequence. How would you handle it? My teaching revolves around the observation that the handler is the architect of the dog’s path. The handler must understand the shape and direction of the dog’s path in order to successfully conduct him upon it. Personally, I’m a huge fan of the RFP as an insurance movement when the handler has the magnet position forward of the dog on a discrimination riddle. Do you understand what I just said? He was blowing me off! In this region there is a strong NADAC influence. I don’t know whether it’s NADAC or insanity unique to the region; but too often what I hear in this area, if the dog makes an error on course, is that the dog is “blowing off” the handler. This is an anthropomorphism that ascribes a motive of willful misconduct to the dog. If you say “He was blowing me off!” what you are really saying is that it couldn’t have been a handler error. You are saying that it could not have been an error or omission of the dog’s trainer. Isn’t it convenient that you can let yourself off the hook and blame it on the dog? 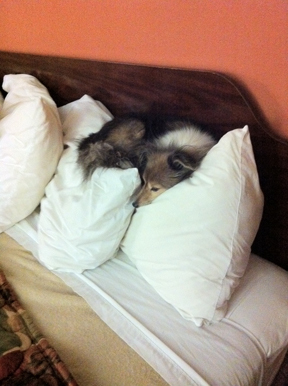 When we’re on the road Hazard has a habit of nesting on my bed pillows. It’s kind of cute, eh? 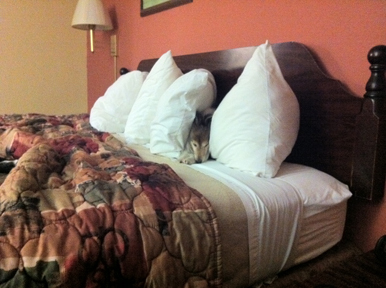 I realized tonight that it winds up being a bit of a test of how soft are the pillows. The softer the pillow, the deeper in Hazard will sink. She and Kory were pretty tired tonight. I guess they stay awake all day in their crates as I work out on the floor with other dogs and their people. Set up a six jump, jump chute. Set the distance between jumps so that it increases by one foot per jump. Set the distance between the first two jumps so that your dog can easily one bounce between the first two jumps. Call dog through the jump chute from other end while videotaping. You may find like I did that your dog will consistently knock one bar. I’ve only had good jumping dogs until my latest girl. She would rather go for it (ETS) versus chipping in to keep the bar up. The above jump chute drill seems to be helping her keep the bars up if I’m stationary. Now I’m starting to add motion and the bar is coming down again, but I’ve just started the motion. I think this will take a while and may never be fully fixed, but she does seem to be trying harder to keep the bars up. I couldn’t resist. I went out first thing this morning to set this up. I didn’t follow the advice to video tape, since I’m here all alone most of the day. Maybe I’ll have an opportunity to film Kory and other dogs in class on Wednesday night. Kory didn’t knock a bar. Though I only did it as a stationary exercise, taking the long lead-out. Moreover, I was impressed by his thoughtful pace. It’s as though he was measuring movement between jumps still two jumps away from him. I put tables up at either end spaced about 15′ from the terminal jumps. After calling him over, I sent him back down the line to the opposing table. This reminds me of the Australian Triple, an obstacle recognized by the Australian Kennel club that is comprised of three jumps spaced apart and intended to elicit a “bounce”. I played with it quite a bit years ago, and even used it in classes and in league play. What you learn quickly is that the three jumps represents a technical obstacle; the dog cannot just plow through it at full speed. 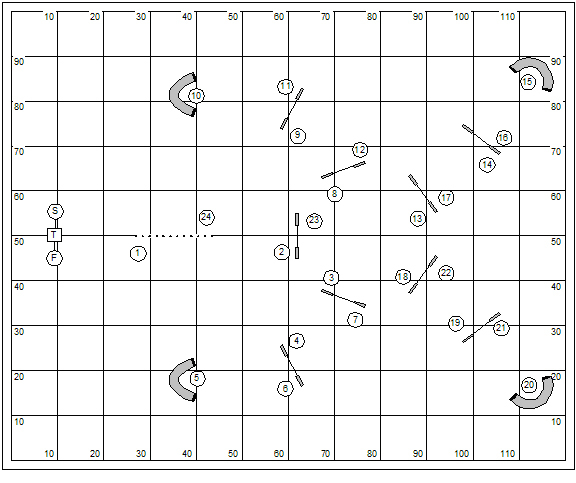 White Numbers – This exercise starts off with a straight-forward dog-on-left sequence to the table. Off the table the handler probably should do a modest lead-out during the table count in order to be deep on the landing side of jump #6 when the dog commits over. A quick Front Cross followed by another Front Cross after jump #7 solves the sequence. The object lesson in this sequence, the dog turns when the handler turns, not where the handler turns. 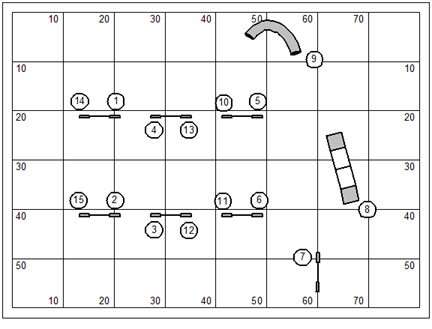 So the handler should be well forward of the dog after jump #6 in order to be in position for another Front Cross after jump #7. Instructor’s Note: Allow your Novice students to do the entire exercise. Black Numbers – Mostly this exercise is an introduction to the Australian Triple. The handler probably wants to start the dog off the table with a Front Cross, and then press forward to the landing side of jump #3 to give a modest RFP to slow the dog’s approach to the technical obstacle. Instructor’s Note: Note that #4 is an Australian Triple; three jumps placed closely together encouraging the dog to bounce the performance of the jumps. The spacing of the jumps in the Triple should be adjusted for dogs jumping different heights. This is a technical obstacle, which means the handler should slow the dog’s approach to allow a controlled performance. White Numbers – The handler might solve the early going of this sequence with a Front Cross on the landing side of jump #2 (the triple). While the instructor counts on the table the handler surely will have to take a long lead-out away from the dog in order to be on the landing side of the tire at #7 for another Front Cross to draw the dog around for the triple at #8 and the finish at #9. Instructor’s Note: For your Novice students do only the first five obstacles. 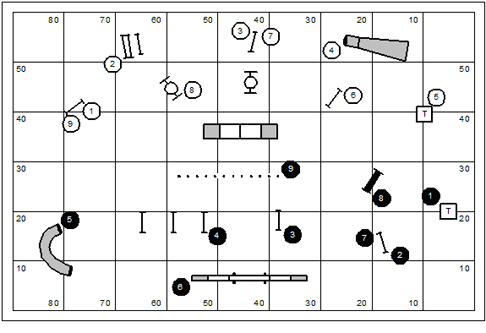 Black Numbers – This sequence might be solved with a single Blind Cross (or Front Cross) while the dog is engaged in the performance of the pipe tunnel at #4. This puts the handler in the uncomfortable position of bending in to the dog after jump #6. The handler might want to resort to a static Post Turn at jump #7 (accelerating towards the jump, then braking to sell the turn to the dog). On the other hand, the handler might keep the dog on left all the way to jump #7. A Back Cross might solve the tightened turn from jump #7 to the panel jump at #8. Instructor’s Note: Allow your Novice students to do only the first six obstacles. The Just For Fun Agility Notebook, Volume 3, Issue #28, August 2006 is a volume of lesson plans for the agility training center. This volume is a whopping 364 pages representing 32 weeks of unique lesson plans complete with a game of the week; and is leveled for four levels of instruction: Beginners; Advanced Beginners; Intermediate; and Advanced/Masters. This issue (and 29 more) is available on my webstore. It’s been a gorgeous week. I got to spend some time outside rebuilding and painting our tractor wagon. The colors were supposed to be John Deere green and yellow. I came close, but not quite. Early last week we pulled an old maple dining table out of a shed where it’s been hidden for about thirty years. It was a puzzle with, metal clips, four inserts and fold up wings. One of the fold down wings looks like it had to live next to a stove and so is darker than the rest of the table for the extra curing. Just in time for Thanksgiving. Three ladies, Crystal, Sharon and Sharmin, who used to train with me in Delaware came down for a vacation weekend. They stayed in the lower cabin, and by all accounts had a marvelous time. They were kind of roughing it. The television in the cabin doesn’t do anything but play old vhs tapes, so it doesn’t even get turned on. The ladies hung out on the porch while their dogs played in the yard. They came up for a couple private lessons. And I got to meet all their young dogs. I wanted to put up an old basic handling drill. This is based on the old Stuart Mah “Oscillation” exercise. #1 through #6 and then #10 through #14 face the handler with the very basic riddle of the serpentine, how to change sides. I’m trying to show here the handler using two different Front Crosses to solve the basic serpentine. 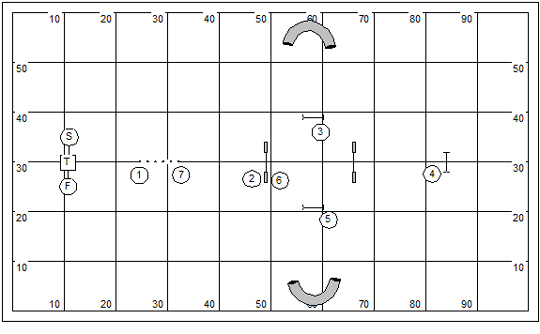 The first the handler puts outside the box, drawing the dog to a corner of approach to set the square approach to the next two jumps. 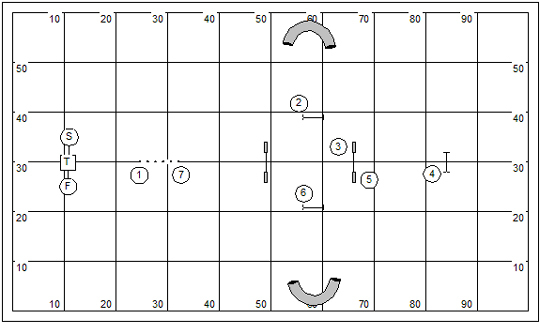 In the second Front Cross the handler drifts to the landing side of the jump, making the cross inside the box and creating a very different kind of path for the dog. In the basic exercise, it’s useful to practice crossing behind the dog as well as crossing in front. It’s not about practicing what a handler is comfortable with. It’s more a matter of practicing technical movements that build a balanced repertoire of handling skills. Failing to practice is practicing to fail. This set of the floor seems to have plenty of opportunity to solve more advanced handling challenges. 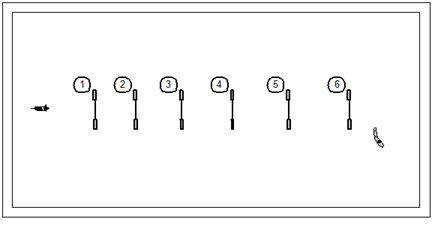 This illustration shows a pull-through in the transition from jump #2 to #3. We should also be able to find a threadle or two, work with simple serpentines, counter-side tunnel traps (from a variety of approaches), and proofing contacts at a distance. Raise no more demons than you can lay down. I’ve about rested back up from the long series of weekends “out of town”. I guess my worse habit when on the road is stealing hours from my sleep at the back end. Sleeping in is out of the question of course. So if I go to bed a bit late for watching a football game or do another bit of work on the computer, there’s really no making up for it. The cumulative effect over a couple of months is awesome. At the end of this week I’m off for Springfield, IL. I get to do a distance seminar with a group of students who are apparently terrified by the prospect. So I’m challenged to perform a bit of alchemy, turning terror into “aha”. We’ll see. You are currently browsing the Bud Houston's Blog blog archives for November, 2011.